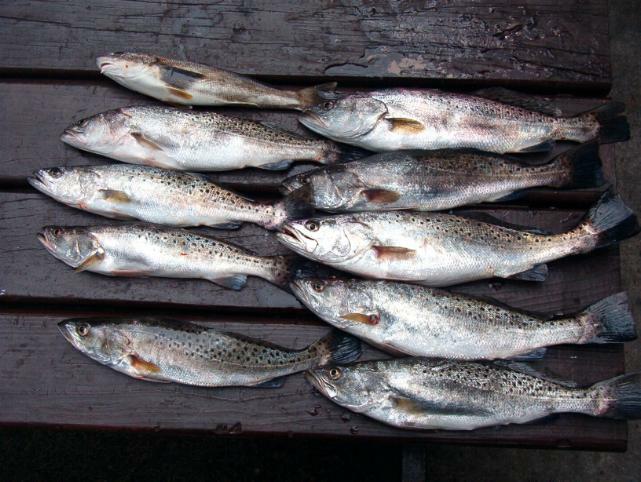 You need to pay special attention when you filet your Spotted Seatrout and be on the watch for parasites that you can easily see.These Trout were taken in 83° - 84° water in Wassaw sound. These fish were caught on an incoming tide in about 6 feet of water. I always check my filets for parasites and found a couple in these fish . 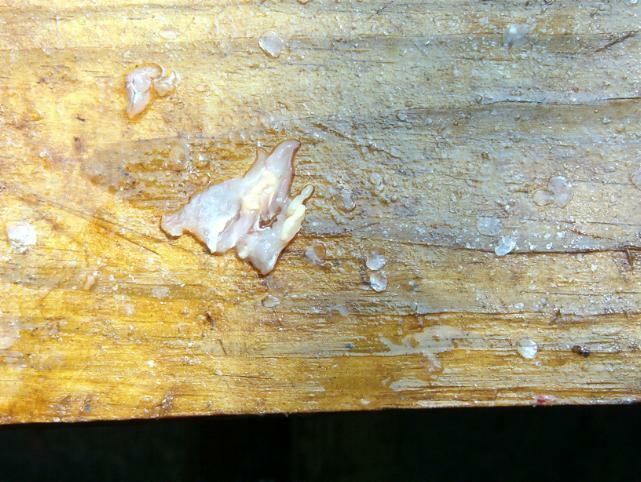 See the pictures below for what the parasite looks like in the filet and cut out of the filet. Research explains that this is probably known as a "Spaghetti Worm", an article appears at the bottom of this page of pictures. 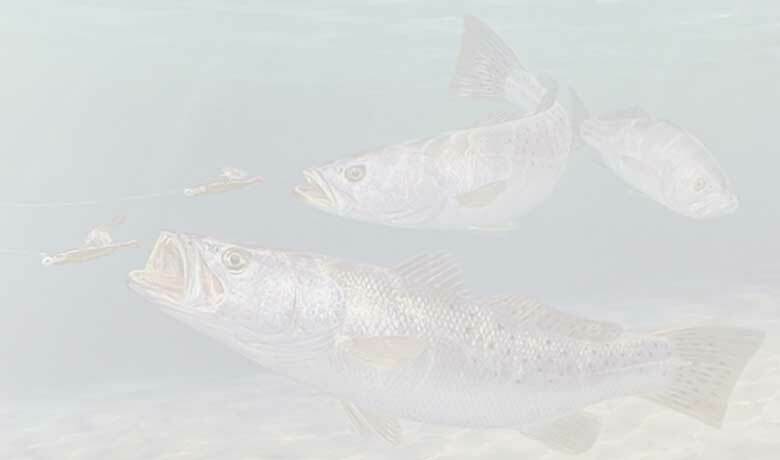 The article points out the following: In general, the saltier the water and the less polluted it is, the higher the levels of infection are. This may be due to either one of the intermediate host's or the larval worm's needs for saline, unpolluted waters. Notice the yellow colored mass embeded in this filet. 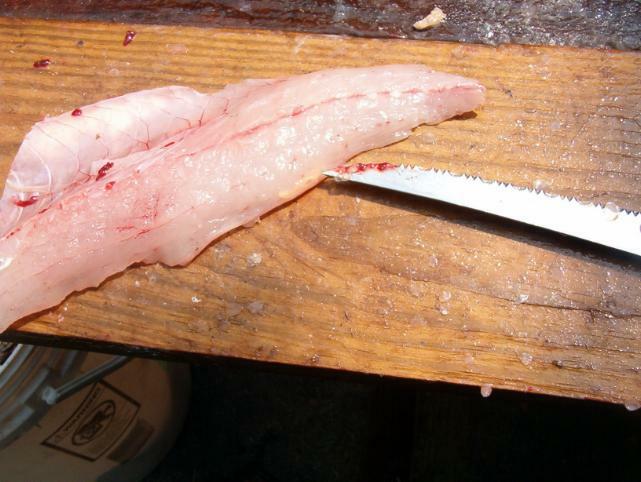 I am pointing to it with the tip of my filet knife. Usually you will find more that one parasite but this is the only one on this fish. Notice the size of the parasite after I cut it out of the filet for this picture. I think it was actually 2 small parasites in 1 area of the fish. Copyright © 2008 Thunderboltcharters All Rights Reserved.